It was a rather strange birthday. We hadn’t planned a big do but little things tended to go wrong. First, the champagne. Back in October I had ordered a dozen bottles with special labels as it was for my 70th. but the day approached and there was no sign so I rang Daniel to see if he wanted us to collect them. “They’re not here yet” he said, but they should arrive tomorrow. He then explained that his wife had been ill so things were a bit difficult. The next day his wife called and said she would tell me the truth. They had the champagne but not the labels. I said I was sorry she was ill and hoped she was feeling better but she sounded a bit embarrassed so I made light of the delay. After all, it wasn’t the end of the world and it was better to have the champagne and not the labels than the other way round. “When do you need them for?” she asked. Alarm bells rang. The date was on the order form. “Oh, we won’t have the labels till the day after” she said cheerfully, “They’re coming by post”. Sure enough, he arrived with 6 bottles and a tale about Martime having skin cancer. Francine, whose daughter is married to their son said it wasn’t true and he had spread stories round the village before about his wife having cancer. How sad is that!? Anyway, CC and I had invited Marie and Yvette to have lunch at the restaurant near us. Marie arrived at 10.30 while i was still helping the carer wash Whale. Bear said hello and then promptly fell asleep so poor Marie had to amuse herself reading the paper until I had finished. CC and Jay were doing last minute shopping in town and they got back with only a few minutes to spare before we had to leave. Sadly, Yvette has been unwell for the last couple of weeks and still didn’t feel up to coming out. Bear didn’t want to sit with ‘gossiping women’ so it was just the three of us. We had a very nice lunch of scallop risotto and then came home for birthday cake number one: a gorgeous blackberry gateau from the best patisserie in town. Then I was given my presents which included a special bottle of Armagnac dated 1974. They had found a bottle from 1944 but it was priced at 900 euros so they compromised!. For the evening we had invited a few friends for an “apero dinatoire” – in other words, drinks and quite substantial nibbles. CC and Jay had catered for 15 people (including us) but, in fact, only three of our guests were able to come. We had a very pleasant evening with loads of food and drink and we are still finishing the leftovers. However, birthday cake number two was polished off the next day. It was a wonderful concoction with salted caramel topping. THEY WERE NOT THE LABELS I HAD ORDERED! OK, it said “Joyeux Anniversaire” but no mention of the date or my age. Call me fussy, but that was the whole point of the exercise – to celebrate the big Seven OH. Still, I’m not letting a minor problem like that spoil what was a really memorable day. For some time after I came to France I wondered if and how I could get hold of baking powder. Nearly all the flour on sale is plain or strong and I was puzzled how French people made cakes. I knew that ‘levure’ was yeast and eventually I learned that ‘levure chimique’ was baking powder and it comes in small flat packets. Needless to say, he bought yeast and so I thought I’d better use it today. It’s ages since I’ve made bread. French bread is so delicious it hardly seems necessary and so I only use yeast when I make Hot Cross Buns. My Magimix has dough paddles that had never been out of the box but today they proved their worth. Arthritis is not helped by kneading dough for long periods and the machine does it in extra quick time. 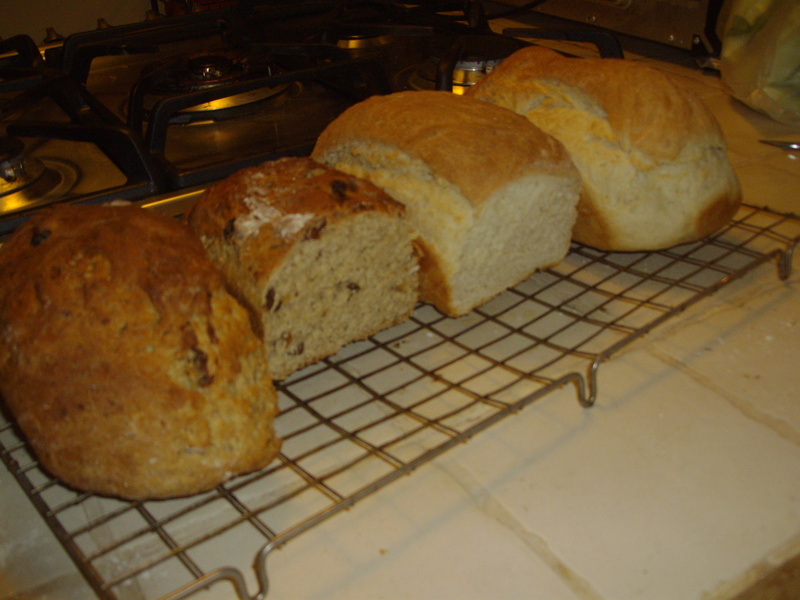 I made two small loaves of white bread and two currant loaves using the Hot Cross Bun recipe. Bear was a sorry sight yesterday. He stayed tucked up in bed refusing to eat, speak or be washed when the carer came. In fact, Gilles wasn’t too bothered as, officially they only have to wash Whale at weekends and bank holidays but, for some reason, yesterday was not considered a day off for nurses and carers. This morning Bear was still determined to stay in bed, refusing to have breakfast and complaining of feeling sick and hurting everywhere. This time, Gillles was more ready to take charge and to my surprise there was Bear in the bathroom being washed from top to toe and NOT COMPLAINING. Half way through these ablutions he announced that he wanted to go and have lunch at the local cafe! OK, I know very well that he can exaggerate but am I too easily taken in? I fell for it yesterday and would have done so today but Gilles proved that he wasn’t as bad as all that. I explained, not for the first time, that I had invited Marie and Yvette to have lunch at the Romerie as neither of them could be free in the evening and CC and Jay had planned an “apero dinatoire” – drinks and substantial nibbles -for the evening. “What time are people coming?” asked Bear. “Right, well as long as they’ve all gone before University Challenge.” was his response. “Sorry, but you’ll have to watch that later on iplayer” is the polite version of my reaction. Bear was determined that he wanted to go to the memorial ceremony in the village this morning but, unfortunately today is not one of his ‘good’ days so he is still in bed – and snoring loudly. I decided to go along for a little while but couldn’t stay for the procession to the cemetary or the ‘vin d’honneur’ as the carer is due about 11 o’clock. The Maire read out the usual message from the government, the children were invited to help her lay the wreath and then she read out the names of the villagers who had died in the two World Wars. We observed a minute’s silence and then the Marseillaise was played before they all walked down to the cemetary which is still colourful after people put extra flowers on the tombs for Toussaint just over a week ago. I slipped off home at this point but I know they will walk round dipping the flag at the tomb of each soldier’s family and then go back to the mairie for champagne and sugar cake. November 11th is a Jour ferié (Bank Holiday) in France so it will be a very quiet day.